As someone who loves vibrant colours, bling, statement prints, and embellished tops, “basics” and “boring” have always been synonymous and interchangeable in my mind. I mean, why would you wear a plain shift dress when you could wear a layered, colour block ensemble? But since I started fashion blogging, my personal style has evolved extensively and I’ve stopped looking at every basic thing as boring. After spending years wearing only track pants and T-shirt or tunic and leggings and being deprived of quality, fun fashion, I was not ready to go back to wearing anything basic, minimalistic or in neutrals. However, since last year I have been reinventing my wardrobe and investing in minimalistic pieces that can be mix, matched and layered. Pieces that look good on their own as well as pair up easily with other pieces and accessories. The first time I visited Amydus website this olive green princess seam shift dress caught my fancy. Chic and stylish, the dress is the epitome of minimalistic style and maximum styling potential. Before I started fashion blogging I hadn’t worn a dress in years and certainly not a simple button-front shift dress. I would not even give a second glance to anything that was not in a pop colour or vivacious print, and certainly not something in a solid neutral shade. Basically, anything that was not statement making was off the table. And yet, the sheer simplicity of the dress is why I instantly fell in love with it. For this look, I wanted the focus to be on the dress itself. Instead of layering it, I decided to pair the dress with contrasting colour pop accessories, statement silver necklace and an oversized tote. The overall look is a fine balance of simple and statement. 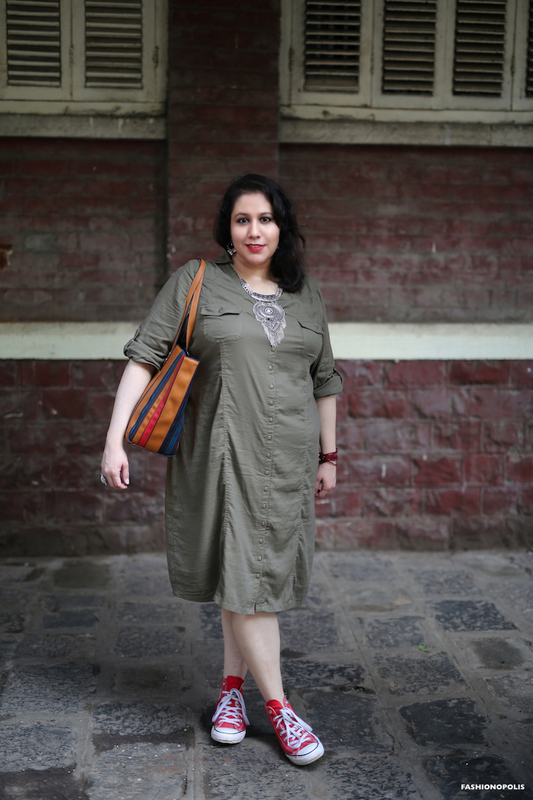 Granted, plus size fashion options in India are painfully limited but Amydus is one of the few size inclusive and diverse plus size brands that is trying to bring about a change and offering affordable and fashionable clothes for plus size and fat women like me. And unlike other plus size brands in India their sizes don’t end at size 22. Amydus sizes go up to UK 26 and 7XL, offering a wide range of size and style. One of the main reasons why I am extremely impressed with Amydus’s collection is because most of the pieces are well-designed, minimalistic with a girl-on-the-go vibe that, when combined with bolder accessories, is pretty perfect for the modern Indian woman. They’re the kind of outfits that can easily be glammed up or can be kept casual and simple depending on the occasion. As a plus size woman I’ve grown up being told and believing I need to hide my body and not bring any attention to it. And because of that I kept away from anything that would make my fat body visible or attract attention. After years of forced minimalism – first, due to the fear of wearing something that would make me look “more fat” and then due to lack of stylish and quality plus size fashion in India – I had decided that I would never ever wear anything that is simple, basic or in neutrals colours. Anything that so much as looked minimalistic was a big no-no. For me, wearing “simpler” ensembles has always been a bit of a challenge. As a plus size woman and fashion blogger, I feel like my outfits and my looks have to be “interesting” in order for me to considered stylish enough and have an impact in the fashion blogging community. For years, I had conditioned myself to believe that basic and minimalistic outfits were not for me and for me to stand out I need to either layer or glam up my looks. But the truth is that I don't always want to dress in the bold pieces or layered looks, I really don't. My real life isn't always colourful tunics and jackets and statement accessories. I've finally learnt that minimalism and simple ensemble can be as much fun and interesting as statement or layered ones. That simple does’t always translate to boring and one doesn’t need glam up at all time to look stylish. Sometimes it's all about a chic and simple dress. And I'm loving this one and the confidence it gives me.